The UniLift is the only stacker that lifts standard pallets without straddling. 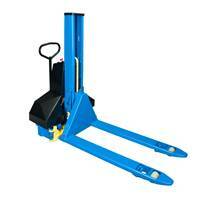 Positions and transports standard GMA pallets & skids and can lift up to 34" high. 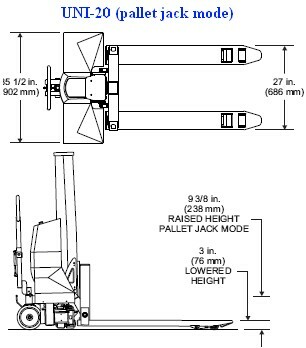 The overall width is only 36" with the outriggers opened up and can lift up to 2,000 pounds. 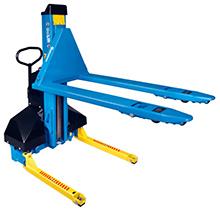 Slim design and maneuverability allow it to move easily through cumbersome and difficult spaces that a traditional stacker might find difficult to negotiate. It has an easy to operate push button electronic console that controls both the lift and the outriggers. It also features a dual function key /battery disconnect switch for operator safety. Also available with optional load wheels on the outriggers, which allow finely tuned load positioning with forks in the high lift position. Lifting Fork Height Maximum: 34"
Easy transitioning from a pallet jack to a stacker in no time to helps you increase employee productivity. As well as helping to reduce accidents, injuries, stress, and fatigue by bringing the load closer to the worker. 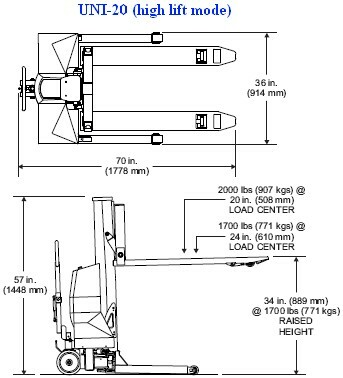 By deploying the outriggers you achieve a high lift load support that does not straddle your load. Thereby allowing you to have a more narrow unit as opposed to traditional stackers. Making it easier to manage around and through tight spaces or where access is limited. Lifting fork height up to 34"
Floor Scale - Summit 3000 & 120 Digital Weight Indicator - 4'W x 4'L x 3-5/8"H, 5,000 lbs Cap.